Welcome to Richmond House, a school where children are happy to learn. Parents, staff and children consider Richmond House School to be one big, extended family. Our building is a converted house, with a very large garden and every member of our school has a valuable contribution to make. We pride ourselves on our school being a place where children are happy to be here and happy to learn. We are an ideal size, big enough to compete successfully in many sports and academic competitions, to perform many wonderful productions, and to make many good friends. Importantly, however, we are small enough for each child to be known and valued as individuals. At our school, children are encouraged in all that they do, and as a result can develop resilience to try new things in a supportive and caring environment. We aim to give children self-confidence, without arrogance, to be proud of who they are, and enable them to go onto the next stage of their education with an enjoyment of learning and the confidence to succeed in whatever they choose to do. Just like all families, we are constantly evolving to continue to build on and develop the excellent work and education already taking place. Schools should not stand still but always be forward thinking and I am very excited and privileged to be leading this remarkable school. Why Choose Richmond House School? Richmond House School is ideally located in Far Headingley, 3 miles from the city centre of Leeds, there are many good schools in and around our area and choosing to invest in your child’s education is not an easy decision to make. In brief, we have class sizes of no more than 18, we have specialist teachers and rooms, including Art, DT, Music, Sport and Languages. We have over 10 acres of sports fields, including a Yurt, an outdoor learning area and a large private car park. We offer flexible, wrap around care, for all children from 7.30 am until 6.00 pm and holidays clubs all year round. Choosing the right school for your child is a personal decision, so please do come and look around the school during a normal school day, speak with children and staff and experience for yourselves the warm, unique and happy atmosphere we have at our school. Starting school is a big step and we welcome children from the term in which they turn 3 into our nurturing and family environment. Children are taught the Early Years educational curriculum by fully qualified teachers alongside specialists in French, Music, PE, Drama and Outdoor Learning. 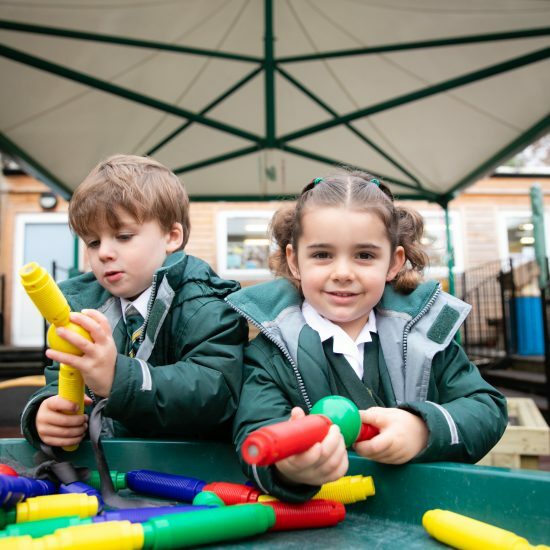 They develop new skills and flourish within the safe and stimulating surroundings of the Early Years setting, where they grow in confidence ready to move up into Year 1. We offer a challenging and varied curriculum, within extensive sports fields and specialist rooms. We are a two form entry, with small class sizes at a maximum of 18 which allows for all children to learn as individuals and involve themselves in the extensive range of opportunities on offer. Academic success is reflected in our examination results, with children attaining above National average and being awarded many scholarships at their chosen senior schools. “Pupils have a love of learning and enjoy their lessons and activities. Their attitude to their work is excellent.” ISI Integrated Inspection.